This past week we lost one of our nation’s great early childhood leaders, Gwen Morgan. I could not let her passing go by without some reflections on what Gwen meant to me, and I suspect, to many in our field. 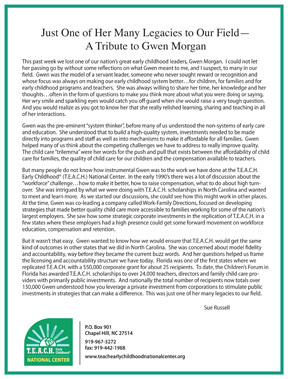 Gwen was the model of a servant leader, someone who never sought reward or recognition and whose focus was always on making our early childhood system better…for children, for families and for early childhood programs and teachers. She was always willing to share her time, her knowledge and her thoughts…often in the form of questions to make you think more about what you were doing or saying. Her wry smile and sparkling eyes would catch you off guard when she would raise a very tough question. And you would realize as you got to know her that she really relished learning, sharing and teaching in all of her interactions. Gwen was the pre-eminent “system thinker”, before many of us understood the non-systems of early care and education. She understood that to build a high-quality system, investments needed to be made directly into programs and staff as well as into mechanisms to make it affordable for all families. Gwen helped many of us think about the competing challenges we have to address to really improve quality. The child care “trilemma” were her words for the push and pull that exists between the affordability of child care for families, the quality of child care for our children and the compensation available to teachers. But many people do not know how instrumental Gwen was to the work we have done at the T.E.A.C.H. Early Childhood® (T.E.A.C.H.) National Center. In the early 1990’s there was a lot of discussion about the “workforce” challenge…how to make it better, how to raise compensation, what to do about high turnover. She was intrigued by what we were doing with T.E.A.C.H. scholarships in North Carolina and wanted to meet and learn more. As we started our discussions, she could see how this might work in other places. At the time, Gwen was co-leading a company called Work-Family Directions, focused on developing strategies that made better quality child care more accessible to families working for some of the nation’s largest employers. She saw how some strategic corporate investments in the replication of T.E.A.C.H. in a few states where these employers had a high presence could get some forward movement on workforce education, compensation and retention. But it wasn’t that easy. Gwen wanted to know how we would ensure that T.E.A.C.H. would get the same kind of outcomes in other states that we did in North Carolina. She was concerned about model fidelity and accountability, way before they became the current buzz words. And her questions helped us frame the licensing and accountability structure we have today. Florida was one of the first states where we replicated T.E.A.CH. with a $50,000 corporate grant for about 25 recipients. To date, the Children’s Forum in Florida has awarded T.E.A.C.H. scholarships to over 24,000 teachers, directors and family child care providers with primarily public investments. And nationally the total number of recipients now totals over 130,000 Gwen understood how you leverage a private investment from corporations to stimulate public investments in strategies that can make a difference. This was just one of her many legacies to our field.